In recent years, 3 Royal Welsh have conducted their annual skiing on the continent as sport, and their winter mountaineering in Scotland as Adventure Training. Ex SHENKIN DRAGON was an attempt to box clever, provide better and more varied training, make better use of planning effort and to minimise the costs to participants. On all four counts it was highly successful and will now provide a template for the future. With Tulloch and Kingussie huts now decommissioned, Norwegian Lodge at the foot of the Northern Corries seemed the logical base for training. 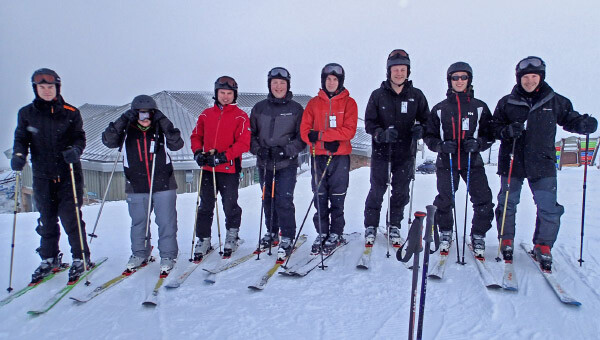 In all, three simultaneous JSAT Foundation Level courses were conducted as Distributed Training (DT); a Winter Mountaineering Foundation (WMF), a Winter Climbing Foundation (WCF) and a Ski Foundation 1 (SF1), the latter likely to be the first SF1 of the new JS Ski Scheme to be conducted in the UK. Conditions on the first day were challenging to say the least – storm force winds battered the students and whipped up a ground blizzard which reduced visibility to zero; a rude introduction for the students who were virtually all new to the environment. Despite this, all three courses persevered and made teaching progress. Additionally, the savage weather merely reinforced the instructors’ assertion that organisation, good equipment and team work were critical to staying safe in the Scottish Winter Mountains. The second day was kinder and gave the groups good mountain vistas and light winds for the morning before deteriorating after lunch. This allowed the WMF group to make a round via Cairngorm summit and Coire Mheadad to check conditions for snow holing later in the week. The skiers travelled to the Lecht ski area and the climbers made an ascent of Honey Pot (IV 6) in Coire an’tSneachda. The third day was forecast to see 120mph gusts on the tops so cunning plans were set. The skiers travelled to Xscape in Glasgow, an indoor ski slope. The climbers travelled to the Onich Slabs for dry tooling followed by a visit to the Ice Factor in Kinlochleven to practise movement on steep ice. The mountaineers sought out drifting at low levels to dig emergency shelters and a group ‘shovel-up’. All in all, good use being made of very limiting conditions. On the fourth day, the mountaineers set out heavily laden for Coire Mhearad where they were to dig snow holes and spend the night. The skiers returned outdoors to the Cairngorm ski area and the climbers, having made solid progress, headed (with the crowds) for Coire an’tSneachda where the students took the lead for the first time on Hidden Chimney(II/III). The fifth and final day dawned windy with poor visibility; the mountaineers packed-up after a successful night in their snow holes and made their way off the mountain. The skiers completed their syllabus, again on Cairngorm Ski Area and the student climbers again led, this time on Fiacaill Ridge (II). Overall, SHENKIN DRAGON was a huge success. Nineteen JS Foundation awards were made, all students gave their all and the best had been made of challenging and varied conditions. The grateful thanks of all are given to The Ulysses Trust whose continued support allows Adventure Training to thrive in 3 Royal Welsh and it’s soldiers to benefit accordingly.